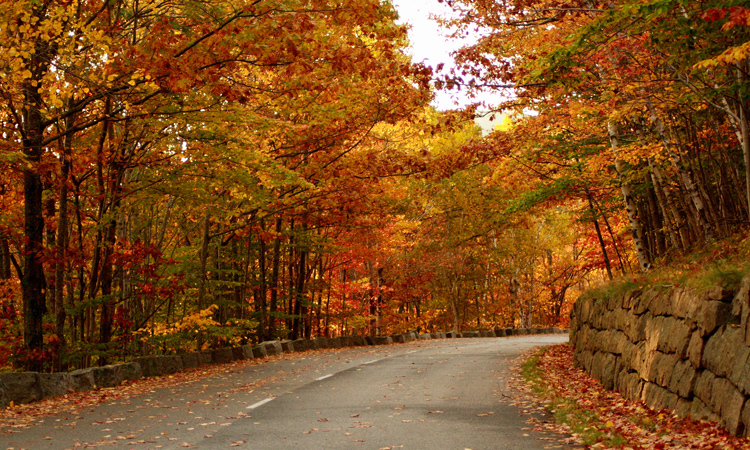 Travel through MidCoast Maine for views of fall foliage from mountain-top to the sea as your vista spans from Mount Battie or the summits of Camden Hills State Park. Veer off the beaten path down a country road inland to Hope, Appleton, or Union where there are pick-your-own orchards abound! The Common Ground Fair draws people from all over New England to Unity Maine for one special weekend, the last weekend in September. The drive there is spectacular. Travel down the Port Clyde or Boothbay or Pemaquid peninsulas, where vistas vibrant with red, gold, orange, and pine green will be interrupted by delicious seafood and secret beaches. At the Coastal Maine Botanical Gardens, celebrate the changing colors of fall with miles of walking trails and an educational experience for the whole family. In Belfast, you also have an opportunity to sail the Penobscot on an educational cruise. To enjoy the autumn foliage from the ocean, including the many vibrant islands of Penobscot Bay, you can rent a kayak for a few hours or an entire day! Stop at Treats in Wiscasset for a perfect to-go lunch for your adventure. Here are four great local kayak companies: Breakwater Kayak, Ducktrap Kayak, Port Clyde Kayaks, and Maine Sport rents! In Warren, challenge yourself to a corn maze that was featured in Downeast Magazine at Beth’s Farm Market. There are more than ten unique trails in Brunswick, Maine for walking, hiking, and biking through the foliage. Find one that fits your level of expertise! Or, ride the rails of the Maine Eastern Railroad weekends in October. The Red Cloak Haunted History Tours unveil the spooky side of Rockland, Camden, Bath, Damariscotta, Wiscasset, Boothbay Harbor, and Newcastle. Explore the beauty of the region against a backdrop of history and a healthy dose of fright. 9. Up And At ‘Em! Rise above the region for leaf peeping from a chairlift at Camden Snow Bowl following their special Sunday morning Pankcake Breakfasts, Sundays in October from 9-12pm. From here, you can enjoy 360 degrees of MidCoast Maine foliage, and even see how the leaves are turning on the islands in the distance. Celebrate autumn with a quintessential New England festival, the Damariscotta Pumpkinfest, where giant pumpkins steal the show against a beautiful autumn backdrop in this small town. October 3-12. Harvestfest in Belfast will be October 30.